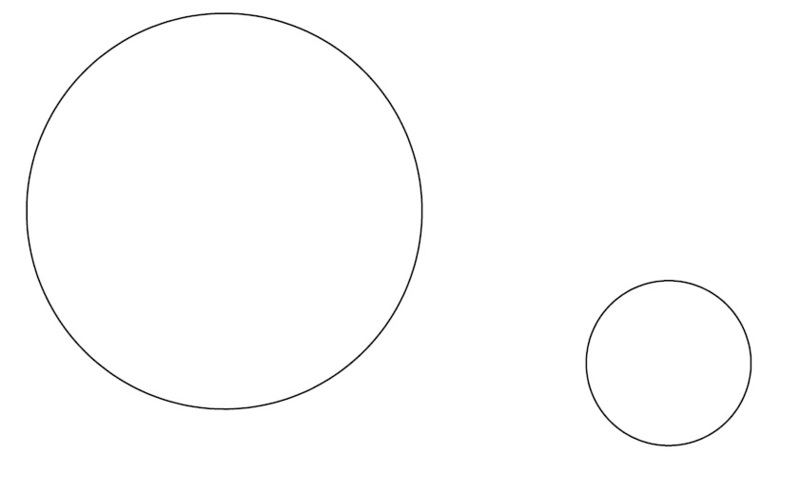 Now you should be confident on all the parts of a circle and how to construct circles. The final section to cover on circles before moving on is tangents to circles. Below we will explain what a tangent is and a few more key points to know. Then we will go through a few basic construction and principles of tangents to circles. 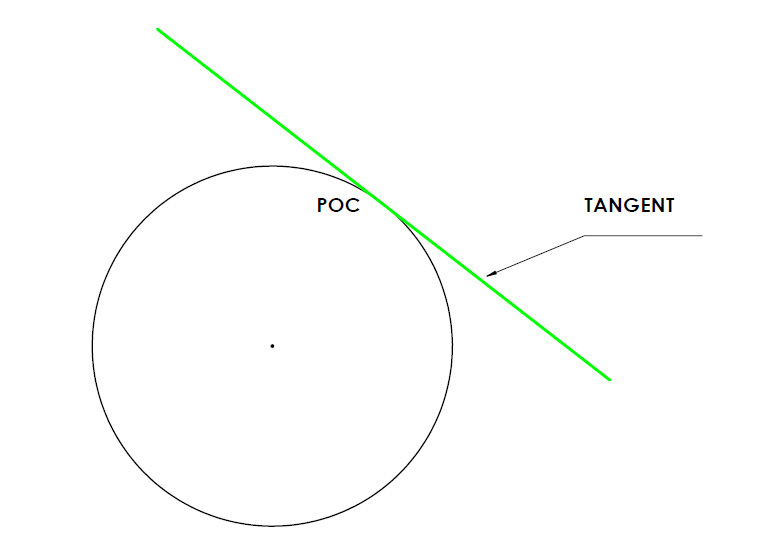 What is a Tangent - A tangent is a line that touches a circle at only one point on its circumference. 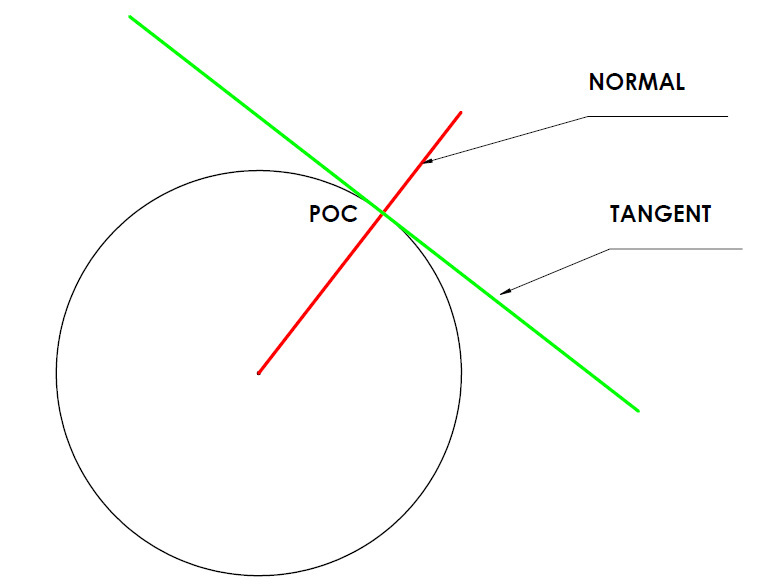 The point where the line touches the circle is called the 'point of contact' or 'POC' for short. An example of a tangent to a circle in real life is a car tyre meeting the road. What is a Normal - A Normal is a line that joins the centre the circle through the point of contact. The Normal line is perpendicular to the tangent. So if you have either the tangent of the normal you will be able to find the other by going perpendicular. Construct a Tangent to a Point on a Circle - In this question you are given a circle and a point somewhere on that circle. You are required to construct a tangent to that point on the circle. Attempt the question first. For a detailed explanation on the principles of the question and demonstration on how to complete the question follow the link directly below. Tangent to a Point on a Circle. Construct a Tangent to a Point outside a Circle - In this question you are given a circle and a point somewhere outside that circle. You are required to construct a tangent from that point to the circle. Construct a tangent to a circle form a point outside it. Construct an Exterior Tangent to two Circles - In this question you are given two circles of any radius and you want to create a tangent that touches the outside of both circles. Construct an Interior Tangent to two Circles - In this question you are given two circles of any radius and you want to create a tangent that goes between the two circles.